A copper coin (fils) of the standing caliph type from the transitional period (AH 74–7/8 / AD 694–8) that preceded Abd al-Malik's coinage reform of AH 77 / AD 696, and which saw the removal of images, and the issue of a pure Islamic type distinguished by the formula of the faith, the Shahada, and a purely epigraphic style that incorporated Qur'anic verses. 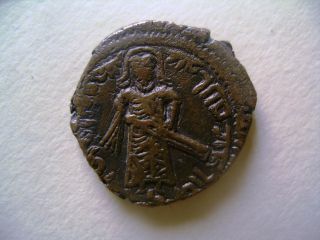 On the obverse is the figure of a standing caliph, he wears a long robe with his right hand on his sword; his head is covered with an Arabic headdress. The marginal legend begins from the top going clockwise, spelling the title and name of the Caliph ‘Abdallah ‘Abd al-Malik commander of the faithful written in simple kufic script. On the reverse there is a transformed cross, distinguished by its simplified form and globular top, which sits on four steps with a star to the left and the name of the mint (Amman) on the right, which was one of the cities of Jund Demashq (one of the five military and administrative provinces established in the early Islamic period). The marginal legend is written in inverted kufic script. It starts from the bottom, going clockwise spelling: 'La 'ilaha illa-Allah' ('There is one God; Muhammad is the messenger of God'), which is the second part of the Shahada, written in Arabic. Copper fils from the Amman Forum, of the ‘standing Caliph type’ from the transitional period that preceded ‘Abd al-Malik’s coinage reform in AH 77 / AD 696. The legend on the obverse is the title and name of ‘Abdallah ‘Abd al-Malik commander of the faithful. 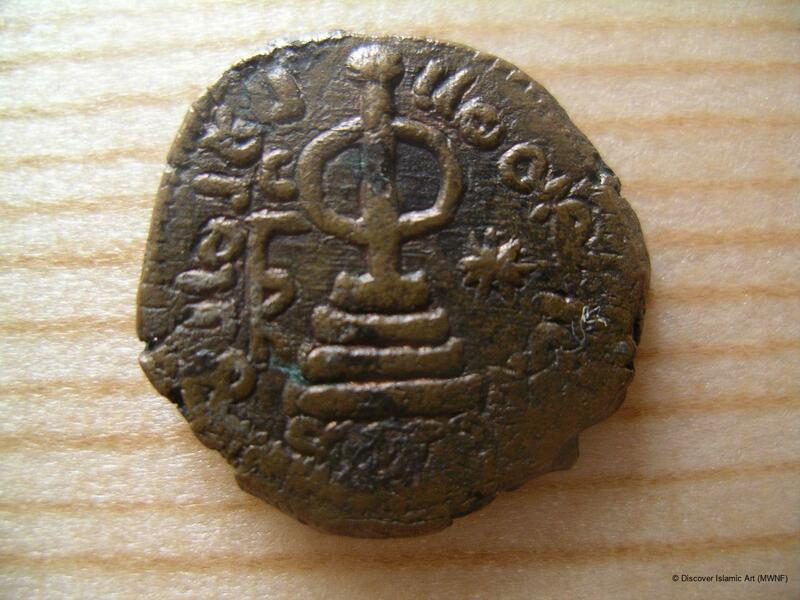 On the reverse is the mint name ‘Amman. This type of coin belongs to the transitional period (74–7/8 / 694–8) which preceded the coinage reform of Abd al-Malik in 77 / 696. The coin was recovered during the course of an archaeological excavation carried out by the Department of Antiquities in Amman's Forum in three stages, between 1965–7. The coin was recovered from an archaeological excavation in the Forum of Amman, and the name of the mint (Amman) is inscribed on the coin. الحديدي. عدنان، فلوس نحاسية اموية من عمان، حولية دائرة الاثار الاردنية، المجلد 20، 1975، ص 9-14، لوحة 7 و 8 رقم 11. القسوس. نايف، نميات نحاسية اموية جديدة من مجموعة خاصة: متحف البنك الاهلي الاردني، عمان، 2004، ص 363، مسكوكة رقم 405. Walker, J., A Catalogue of the Arab-Byzantine and Post-Reform Umayyad Coins, London, 1956, Vol. II, p.29, cat. no. 96.